Before the July 1st Free Agency period begins for the NHL, let's take a look at the Vancouver Canucks roster, and where areas they are likely to address, as well as some favourable options available to them. 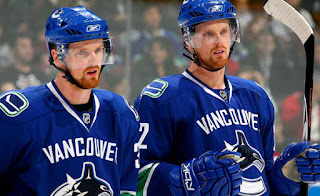 The Canucks top line will likely remain intact, with reigning Hart Trophy winner Henrik Sedin centering Daniel Sedin and spark plug Alexandre Burrows. While Burrows may miss some time early with off-season surgery, this line should be together for the season, with occasional tinkering a la Mikael Samuelsson. This second line can also serve as a shutdown line come playoff time with speedy two way players. Ryan Kesler and his wingers enjoyed break out seasons and each will be expected to replicate what they did last year. This line looks to be the second line on opening night, barring the possibility that GM Mike GIllis signs a higher profile scoring forward to supplant one of these players. Line #3 - Jannik Hansen - ? - ? The Canucks third line appears fairly empty right now. Last year's mainstays of Kyle Wellwood and Steve Bernier saw time with a rotation of Tanner Glass, Mikael Samuelsson, Michael Grabner, Jannik Hansen and Pavol Demitra. Vigneault and Gillis will have to decide if their third line is going to be swift and capable of pitching in offence, or bigger and stronger, capable of providing some size and grit that are fairly absent on the top two lines. If the Canucks stand pat, their third line could include Jannik Hansen, Tanner Glass and perhaps a rookie such as Cody Hodgson or Jordan Schroeder, but those players may be better suited for a scoring role. The Canucks 4th line also saw quite the rotation last year, Jannik Hansen, Tanner Glass and Steve Bernier often dropped down to replace Darcy Hordichuk when he was scratched. One of those players would join Ryan Johnson and Rick Rypien to provide some ultility players used for shot blocking, penalty killing, or creating a spark. The Canucks could also use the recently acquired Viktor Oreskovich from the Florida Panthers. The Canucks do have a bevy of forward prospects, but most appear poised to occupy a spot on one of the top two lines on a call up basis. Jordan Schroeder had an impressive late season with the Manitoba Moose, and he and Cody Hodgson will likely be the stars of training camp. Beyond that, Sergei Shirokov and Anton Rodin are exciting but may not be ready yet. Beyond that, the Canucks will have to rely upon checkers like Alexander Bolduc to fill in if they do not extend offers and nab anyone from the free agent pool.